‘Nel blu dipinto di blu’, better known under its alternative title ‘Volare’, the worldwide bestselling hit composed and originally performed by Domenico Modugno, was arranged for the Sanremo Festival final of 1958 by Alberto Semprini. After Modugno’s Sanremese victory, Semprini joined him in his participation in the Eurovision Song Contest, held in the AVRO Studios in Hilversum, Netherlands. Under the guidance of the Anglo-Italian conductor, Modugno reached a third place. Alberto Semprini, christened Alberto Fernando Riccardo Semprini, was born in Bath, 1908, as the son of an Italian father and an English mother. He studied composition, conducting and piano at the Verdi Conservatory in Milan, Italy, graduating in 1928. During the 1930s and early 1940s, Semprini worked in Italy as a pianist and as an orchestra leader. For some time, he was deputy conductor of the Scala Opera Orchestra in Milan. In 1942, he toured the country with his Grande Orchestra Ritmo-Sinfonica, accompanying the likes of Lucia Mannucci and Ernesto Bonino. During the last stage of World War II, Semprini was discovered by actor Michael Brennan (1912-1982), who served in the British armed forces. Brennan took Semprini back to England, where his semi classical style of piano play caught on, too. In 1957, the BBC gave him the chance to exhibit his talents in his very own radio show, ‘Semprini Serenade’, which ran for 25 subsequent years until 1982. In it, Semprini showcased his versatility by playing keyboard arrangements of old and new songs, light classics and themes from films and shows. Initially, the orchestra accompanying him was the BBC Revue Orchestra under the direction of Harry Rabinowitz, but later ensembles led by other conductors took over, amongst whom Vilem Tausky. The show always opened with a tune composed by Semprini himself, ‘Mediterranean Concerto’, after which he used to utter his catchphrase ‘Old ones, new ones, loved ones, neglected ones’. Many of the arrangements for both piano and orchestra were written by Semprini himself. He did more than 700 programmes of the weekday evening show. Although critics dismissed it as the musical equivalent of syrup, the programme consistently drew huge audiences. Semprini recorded many of his Mantovani-like versions of well-known compositions, such as Tchaikovsky’s Piano Concerto no. 1. In the meantime, Semprini – mostly, he was simply referred to by his surname only – kept on having a career in Italy as well. 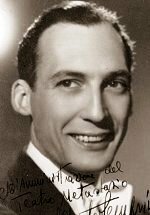 He composed songs and worked as an arranger and conductor in Milan’s studios for many artists (jazz singer Natalino Otto, for example), while also making recordings with his own ensembles, such as the Sestetto Azzurro and the Quintetto Ritmico. In 1954, Semprini, who at that time was considered a modernizer in the country’s light music industry, was asked to be the musical director of the highly popular Sanremo Festival. Providing rhythmical accompaniment with his Sestetto Azzurro, Semprini worked with half of the participants (Katyna Ranieri, Flo Sandon’s, and Gianni Ravera, amongst others), the other half of them being trusted to the more traditionally sounding orchestra of maestro Cinico Angelini. Both in 1955 and 1958, Semprini received an invitation to return to the festival with his sextet. The 1958 Sanremo Festival was a turning point in the history of Italian music. The winning song ‘Nel blu dipinto di blu (Volare)’, composed by Domenico Modugno, broke all records in terms of sales, both domestically and abroad – mainly in America, though cover versions of it have been made the world over. Semprini wrote the original orchestration for his sextet, with which he accompanied Modugno during his winning performance in the Sanremo Festival. Moreover, he recorded the song with the Apulian singer-songwriter on the Fonit-Cetra label, as well as releasing an instrumental version of his own. As was usual in those days, the winning song of Sanremo went on to become the Italian Eurovision entry. Semprini travelled to the Netherlands with Modugno to participate in the third Eurovision Song Contest, staged in the Dutch TV studio in Hilversum. Semprini wrote a new, orchestral arrangement to the song, matching the symphonic composition of the Dutch home ensemble, Dolf van der Linden’s Metropole Orchestra; an instrumental break in which the brass section was given an opportunity to excel, is the most striking feature of this new version. Modugno was allowed to sing his song twice, because, allegedly, during his first rendition there had been a technical problem resulting in the song not having been transmitted correctly to various countries. In spite of the lasting fame that the song – perhaps the most well-known composition ever to have participated in the Eurovision Song Contest – was destined to win, Italy was beaten by winner France and Switzerland into a third spot. Modugno went on to participate both in the Sanremo Festival and the Eurovision Song Contest on several more occasions, but he never worked with Semprini again. Why, after 1958, Semprini was never asked again to be musical director in the Sanremo Festival, is one of the enigmas of this contest’s history. Unfortunately, so far it has not been possible to gather memories of other artists on Alberto Semprini. Adriano Aragozzini, ‘Enciclopedia del Festival di Sanremo. Quarant’anni di Musica e Costume’, Milan 1990 (edited by Rusconi). Dario Salvatori, ‘Sanremo 50 – La vicenda e i protagonisti di mezzo secolo di Festival della canzone’, Rome 2000 (edited by RAI, Radiotelevisione Italiana). Various websites on English light entertainment and broadcasting history, such as www.swalwell.co.uk, www.whirligig-tv.co.uk, www.musicalweb-international.com and www.radiorewind.co.uk. A light, however dim, on Semprini’s activities in wartime Italy can be found at www.festivalvillabasilica.it. Sleeve notes to the CD ‘5° Festival della Canzone Italiana – Sanremo 1955’ (edited by Twilight Music, AS0517, in 2005). Unfortunately, no website on Alberto Semprini exists.